With a pretty garnet color, this wine has aromas of cherry pie and cranberries (maybe because we tasted around Thanksgiving). It exhibits vanilla spice and cloves in the front with strawberries and pomegranate on the midpalate. The Old and the New has a nice solid midpalate with bursts of bright red fruits, the subtle tannic structure shows a bit after opening, some cola flavors emerge, and a touch of leather. There is definitely spice on the finish—hints of white pepper and clove, with an oaky flourish. Cool and clean. 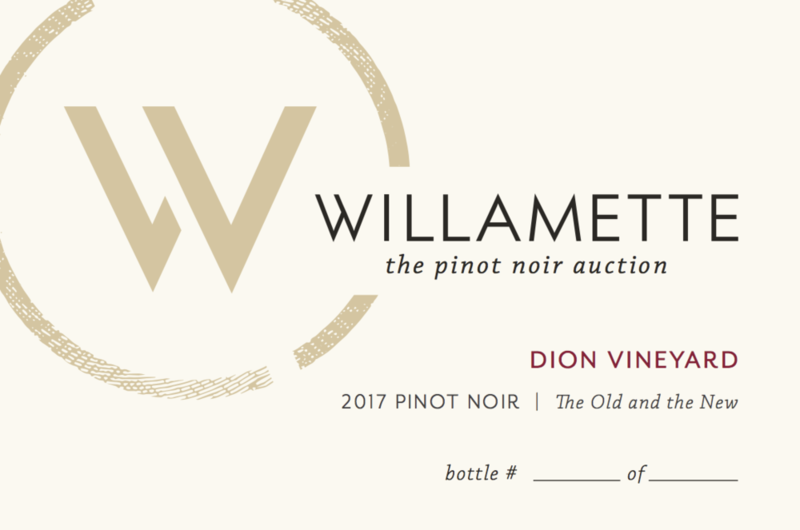 This is our second Willamette: the Pinot Noir Auction and we wanted to have something different to show and have some fun at the same time. Kevin and Beth taste through all the barrels individually, looking for the best, and we went into our session looking for uniqueness and true characterization of our Laurelwood soils and vineyard site. When we combined the old-vine Pommard barrel sample with the best of the 115, we knew we had our wine. The oldest block of our vineyard combined with the youngest—both superstars in their own right, and often bottled on their own in our Old Vines or the 115 West, but definitely anchoring our Winemaker’s Reserve barrel select blend. Paired together in a combination that doesn’t exist in our current lineup, it’s Batman and Superman together for the first time. This wine saw 50% new oak. The 2017 harvest was a lovely one; after several years of early Septembers with dust (windblown soils help make great wines, but are not so fun after a dry summer) and heat, we were happy for a cooling period and a later development of the fruit flavors. We have 60 acres, planted to different clones and at different times, that generally don’t all ripen at the same pace. 2017 threw us a curveball and we brought in all the fruit for our own winery in two to three days. Beth went from an empty, clean fermentation room to nine macro-bins in a flash. The most curious thing was that all the grapes were between 22.5 and 23.5 Brix at harvest, and everything started fermentation spontaneously. Maybe it was that eclipse! Either way, daily punchdowns and samples became a monumental job immediately. We were really happy with the pace and progress of fermentation and we believe the 2017 vintage shows amazing promise for long-term development and is a classic Oregon Pinot noir. Dion Vineyard was founded in 1973 with plantings on a five-acre plot in what is now the Chehalem Mountain AVA of the Willamette Valley. Dion is short for Dionysus, the Greek God of Wine and Viticulture (and fertility—ha!) and also winemaker Kevin's middle name, although he was founded in 1970 and started the wine label in 2007. The vineyard has grown to 60 acres and continues to supply quality grapes to others in the Willamette Valley. Kevin and Beth produce about 1,200 cases of wine from estate fruit in a small facility.